Couldn’t emphasise any more on how true this is. Don’t let your training go to waste and stick to your planned pace. It’s hard though when throngs of over zealous people blaze past you in the first few miles or so. “Why is everyone so damn bloody fast?” You wonder. Panic seeps in and you quicken your pace. In another article by the globe and mail, running too fast in the first mile can ruin your race and it’s really true! 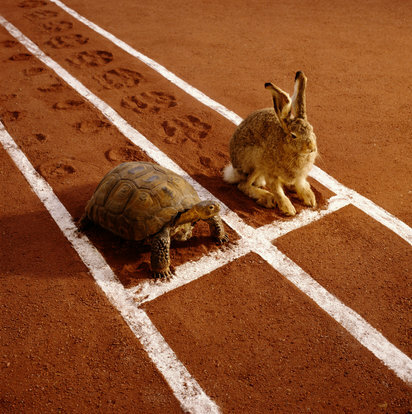 Remember, slow and steady wins the race. Run your own race at your own pace. Here is where the fun begins. If you are still going strong, congrats. If you feel like doing this and chances are you might..
You either pushed too fast too soon or a host of other reasons (which I can think of but am too lazy busy to list for now) Read these top 10 ways to finish your race strong. I am in favour of running no.5 – negative splits as I am truly a slow starter and get my mojo only during the second half. The one thing in my mind that psyches me up and gives me enough energy to finish strong is that I tell myself, the faster I finish, the faster I get to rest! So walking is therefore not an option for me. Works for me every time, you just need to find what motivates you! Fail to train and you lose your dumpling! This photo cracked me up. On a sadder note, I think I will forego my TNF100 trail race in Oct. There is no way I can run a good one since being out of action since May this year. Even in the event that I heal completely and in time, it isn’t wise to subject my leg to a trail run and risk it being injured again. It’s like waiting for glue to dry and when it has scarcely done so, you try to pry it open to see if it sticks. This was so funny, I had to share!